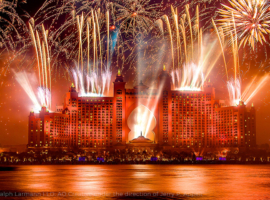 For the huge New Year‘s Eve celebrations at Dubai’s leading entertainment resort a light and fireworks show including a 360° façade illumination with searchlights should be realised. 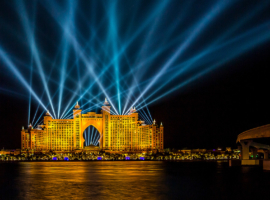 With a six-minute light show, Dubai wanted to celebrate the arrival of the New Year at the Atlantis Resort in incomparable style. 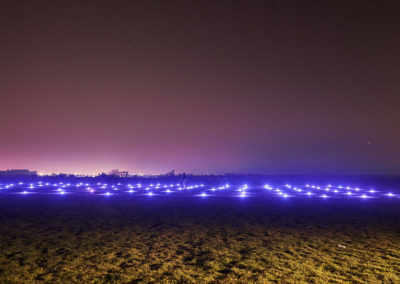 For this record-breaking event a time-controlled lighting choreo­graphy accompanied by music had to be designed and realised. 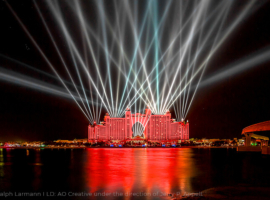 AO Lighting appeared in the role of general contractor, whilst AO Creative was responsible for the design, control, execution and operation of the light show. 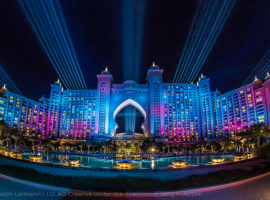 The team of AO Creative designed a lavish illumination with lush colours adorning the façade and moving searchlights on the roofs that could be seen for miles around. This was the first time that FALCON 6000 CMY searchlights had been employed as wall washes and they proved fully convincing in the role. 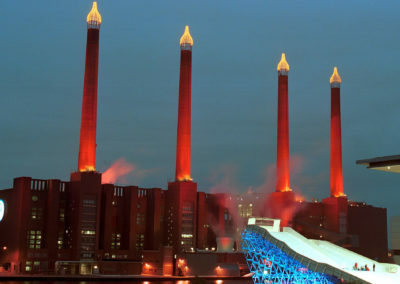 SKY FALCON ARC colour floodlights supported the façade illumination. On the beach side, the main public area, FALCON CMY LED-VIDEO moving LED/xenon hybrid searchlights with LED panels complemented the facade illumination and the play of beams from the roof. 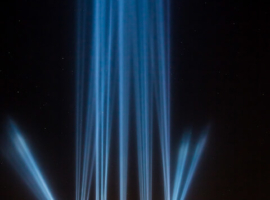 The installation of the FALCON BEAM colour 7,000W searchlights on the roof, incidentally, was also no simple matter, as the devices and equipment had to be moved through the lobby and up the stairs of the hotel while it was still receiving guests. 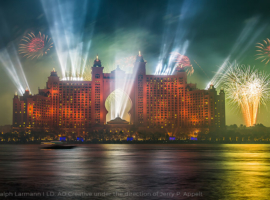 With a six-minute light show, Dubai celebrated the arrival of the New Year at the Atlantis Resort in incomparable style. 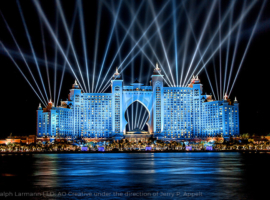 AO Creative managed in the end to make this already luxurious hotel even more magnificent and impressive. 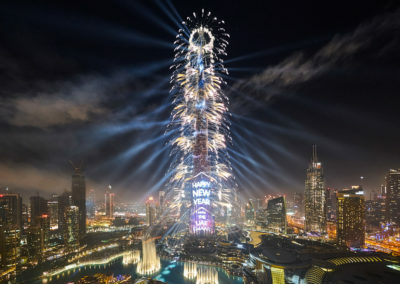 Finally AO Creative participated in a record­breaking production, as the accompanying firework display involved the use of some 500,000 individual fireworks! This was one Arabian night in which the sense of expressions like ‘sea of light’ and ‘riot of colour’ became abundantly obvious. 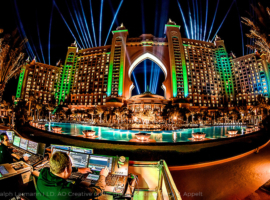 Accompanied by the Atlantis’s legendary Sandance Music Festival, the event drew partygoers in their thousands from all over the world.